Are you a fan of Coraline and looking for another book to satisfy your need for Young Adult Fiction? Well I will gladly help your through your addiction since I suffer from the same affliction. The Cavendish Home for Boys and Girls will give you a quick and easy fix. The book is an excellent “curl up in your snuggie while you drink hot chocolate as the snow falls outside during the weekend” book. And for avid readers it’s more of a “I have an hour or two to kill while I wait for the prices to go down on Kindle” book. But regardless of which category you fall under, you should read it. Right away you are introduced to the perfectly polite twelve year old, Victoria Wright and her skunk-haired, piano-loving friend, Lawrence Prewitt. Well, Lawrence is actually more of Victoria’s project than a friend, Friends were messy. Victoria hated messes. But Victoria’s perfect world soon gets disheveled when Lawrence suddenly disappears on a Tuesday, which just so happened to be her least favorite day of the week. Now Victoria solve the mystery of her friend’s, I mean Lawrence’s disappearance. Her investigation is filled with even greater mysteries, strange grinning adults, and creepy black bugs who seem to watch her every move. And it isn’t long before her search for Lawrence lands her in The Cavendish Home for Boys and Girls. The home ran by the overly charming Mrs. Cavendish and her weird sidekick Mr. Alice. Once inside, Victoria must use her manners, wit, and courage to save herself, the other kids of the town, and most of all, Lawrence. Every twist and turn in the home leads Victoria up to the final showdown between her and Mrs. Cavendish. Who will win? 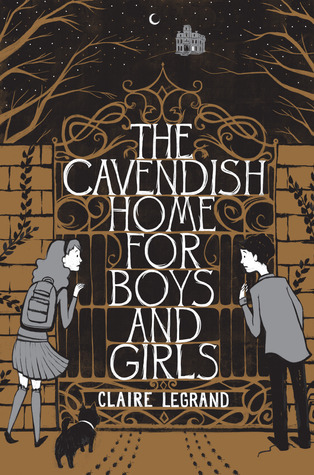 This is the first novel by Claire Legrand and I expect many more great stories from her to keep our addictions going. I would have given the book 5 stars, but I made the mistake of reading the Epilogue. Spoiler Alert: There’s a predictable “cop out” ending in the Epilogue. 2) Joanna Chambers.’ Provoked PLUS pre-orders of next 2 books in this m/m, historical trilogy. Kindle U.S. only. 1) Lauren Kate’s Fallen will be given by Melpomene from Random Book Muses. Print or Kindle, U.S. only. 2) Carlos Ruiz Zafon’s The Shadow of the Wind will be given by me. Print or Kindle, U.S. only. So join me on Facebook or find me on Twitter (@vi_dao) to enter these contests!